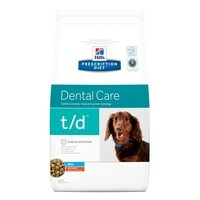 Hills Prescription Diet TD Dental Care Mini Dry Food for Adult Dogs is a nutritionally balanced diet for the management of dental disease and to help maintain oral health in smaller breed dogs. Made with a smaller kibble suitable for smaller mouths, Hills T/D Mini has been made with a specially designed kibble shape that will engulf the tooth before splitting, to allow the specially aligned fibres to clean the tooth’s surface. Hills T/D Mini has also been made with a reduced level of protein and calcium to help limit the amount of plaque and tartar build-up on the tooth’s surface in general. I have been giving my dogs a few of these bites after each meal for a couple of years and it has definitely helped with cleaning their teeth. Our Cavalier King Charles was recommended to go onto this food after losing half her teeth, she seems to be retaining the few that are left on this food, it is supposed to clean the teeth and seems effective.